So, you are up to driving. That’s great. Now let’s imagine a scenario. One fine morning, you’re on a busy car ride and faced a sudden tire blow at the rear tire or flat tire. You’ve been smart enough to keep a spare tire on the car. But unfortunately, you not confident about doing the tire replace yourself. Maybe you’ve seen people doing this, but had not been in the same shoe ever before. Then how to change car tire? Such situations can be the worst nightmares for anyone who drives. To have an in-depth knowledge and enough practice on that is one of the sole skills drives need to acquire. In case you’re still unfamiliar with this particular skill, it’s not been too late yet. In this article today, I’m explaining the easy steps to change a car tire with a few tools in hands. Hope this would be the last article you read before you become a pro at this. A perfect size spare tire(must). Westlake tires is my favorite brand. Before starting the process, make sure there is no one in the car. And the car is at a safe side of the road (in case you have a tire blowout). Also, the place your damages tire is should be a flat and safe place. It’s pretty hard to do a rare change in an uneven surface. Turn your emergency flashlights. Place a small log or a brick in front of the front tires. Do the same for the back tire too. This won’t let the car move. We’ve just provided a list of items you need to have in the toolbox, along with a spare tire. At this step, bring them out. Of course, you have the jack for your car in the toolbox. To life, the car up, place the jack on the spot that it should be in. The unit-body cars have a small mark or notch where you should place the jack. It’s usually in the behind the front wheels, or in front of the rear wheel. Remember, as you don’t place the jack right, it can or can damage the plastic on the bottom off the plastic. Not it’s time to let the nuts loose. If you have a wheel cover fitting right on the tire, remove them to access to the nuts. Now, use a wheel wrench to loosen the nuts up. In case of tighter nuts, you need to apply more pressure on the car wrench. Use your legs to push the additional pressure. Don’t worry, car wrenches can take that. Finally, as the nuts are done, remove the nuts from the wheel. And take the wheel out of the car body. In case of tires that hadn’t been changed since months, the can be hard to remove due to rust. Try pushing the tire from inside with something sturdy. Replace the spare tire into the place of the older one. And while doing this, make sure the rim of the car is properly aligned with the axis of the new tire. Also, stay careful so that the tire isn’t installed backward to the position. The way to identify that is- the valve stem of the tire will face outward from the vehicle. Be sure about the tapered part of the nuts, while you’re almost done with placing the new tire. If you’re sure that the spare tire is placed in the right spot, not tighten the nuts till they are all snug. If you are new to changing a tire, do some practice runs. For practice, it’s better to do it on flat surfaces. 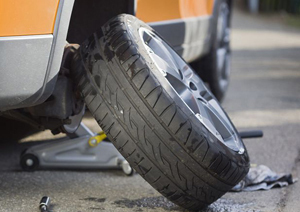 For any instance, you need some basic equipment to assist you in the process of tire changing. Keep a piece of plastic, a torch with spare batteries and a pair or regular hand gloves in the car. Be well knows with the manual of the car. Check the condition of the spare tire on regular basis. 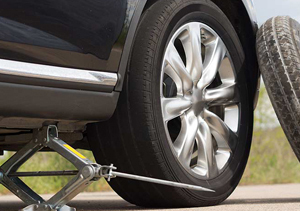 Let yourself be aware of the pressure of your car tire at any moment. There are many electric devices like Car Pressure monitor to help you out. Tire blowouts are likely to happen to cars that are being on the road for a couple of years or more. So, if you have an old car, do regular checkups. Look for the tools and jacks are working perfectly and are always in stock. Don’t mess any kind of risk while changing the tire. Remember, there are always experts to help you with a roadside assistance.